Central Illinois Care Services (CICS) recently opened its newest office in Glen Carbon to provide services to the Metro East and part of southern Illinois to complement its original Effingham location. Owners Jeff Stassi and Steve Boyd have been working with the Illinois Metro East Small Business Development Center (SBDC) at Southern Illinois University Edwardsville since early 2016 to enhance their business operations. SBDC Director Jo Ann Di Maggio May has provided expertise in reviewing the CICS business plan, and recommending resources and assets to support its growth and business. The SBDC also provided financial and public relations resources. CICS provides home health services in 24 counties. The company has more than doubled its growth in the past year expanding the number of counties and clients served, caregivers and growth in income. “Jo Ann has continued to stay in touch and connect with us through email and at networking events, and we appreciate that,” Jeff stated. CICS provides a wide variety of services, personal assistance/daily living activities, senior care, respite care, disabled care, recovery care, cancer recovery, stroke recovery, surgery recovery, rehabilitation, post-hospitalization care and hospice care. The agency is licensed, bonded and fully insured. All caregivers are background checked for client safety. Each area of expertise has caregivers who are experienced and assist patients with all their care needs. CICS’s mission is “exceeding client and family expectations in providing the highest standard of home care and client safety.” CICS core values are carried out as staff are respectful, compassionate, empathetic, honest, and provide care with dignity and integrity. Stassi and Boyd make sure they have the most qualified staff to provide the necessary care and services to their clients. They promise to perform the client assessment and schedule a caregiver within 24-48 hours of contacting them and have never refused a client. Each client’s care plan is unique to individual care needs, their health, and individual preferences of the client. CICS cares for its clients like they are their own family. Stassi and Boyd have always been passionate about helping others. Both came from backgrounds of helping people as Jeff was the past regional vice president of the American Cancer Society, and Steve was the past chief financial officer of the American Red Cross. They are passionate their business and take pride in being involved as hands-on owners. The newest investment within the company is for caregivers. Each will be trained and certified in dementia and Alzheimer’s care, as well as the industry best practices in home care. 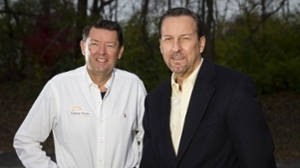 Stassi and Boyd “are focused on being the most trusted source of quality home care in their service areas. We know that the need is real and the need is immediate.” They continue to focus on developing caregivers with education in providing safe, quality care. They are building their agency with resources for training, technology, staff, additional management, schedulers and recruiters to handle the growth of care needs by the current baby boomers, who want to age in place in the happiness and safety of their own homes. Central Illinois Care Service can be contacted at either office location in Effingham at 217-994-9016 or Glen Carbon at 618-391-7138. Visit CentralIllinoisCareServices.com for more information about the company or services. The Illinois SBDC for the Metro East assists start-up ventures like Central Illinois Care Services as well as existing businesses headquartered in the nine-county region of Calhoun, Jersey, Madison, Bond, Clinton, St. Clair, Washington, Monroe and Randolph. It is funded in part through a cooperative agreement with the U.S. Small Business Administration, Illinois Department of Commerce and Economic Opportunity, and SIUE as a service to Illinois small businesses. Photo: Steve Boyd, left, and Jeff Stassi, owners of Central Illinois Care Services (CICS).